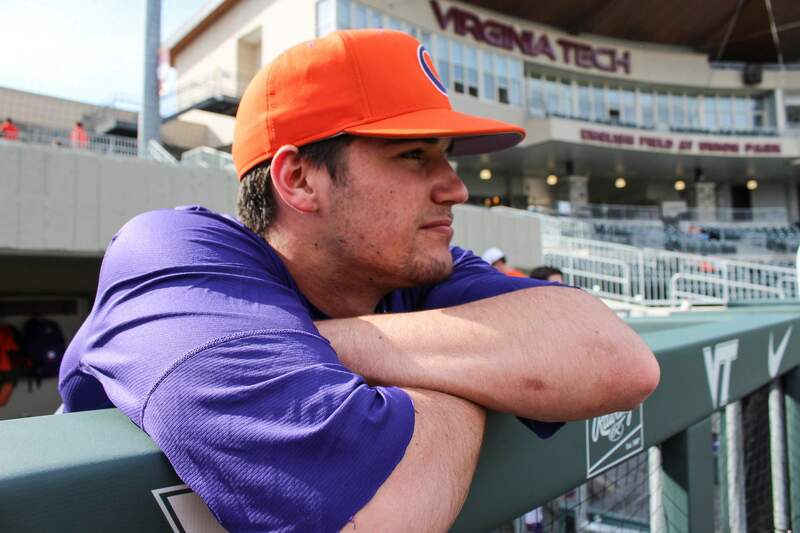 BLACKSBURG, VA. – Grayson Byrd went 3-for-3 with a home run and Davis Sharpe pitched 6.0 strong innings to lead No. 15 Clemson to a 6-4 victory over Virginia Tech at Union Park on Friday night. The Tigers, who took a 1-0 lead in the series, improved to 20-6 overall and 7-3 in the ACC. The Hokies dropped to 16-10 overall and 4-6 in ACC play. In the second inning, Elijah Henderson grounded a two-out, two-run single for his first career hit, then Byrd smacked a solo homer, his third of the season, in the third inning. After Logan Davidson extended his hitting streak to 14 with a two-out single in the fifth inning, the Tigers scored three runs, including two on run-scoring singles by Byrd and Bryar Hawkins, to up their lead to 6-1. The Hokies scored a run in the sixth inning on a wild pitch, then added two runs on Kerry Carpenter’s two-out, two-run triple in the seventh inning to narrow Clemson’s lead to 6-4. Sharpe (4-1) allowed just three hits, two runs (one earned) and two walks with six strikeouts to earn the win. Carson Spiers pitched the final 2.1 innings to record his eight save of the year. Hokie starter Ian Seymour (4-1) suffered the loss, as he yielded nine hits, six runs and one walk with three strikeouts in 6.0 innings pitched. The series continues Saturday at 3 p.m. on ACC Network Extra.